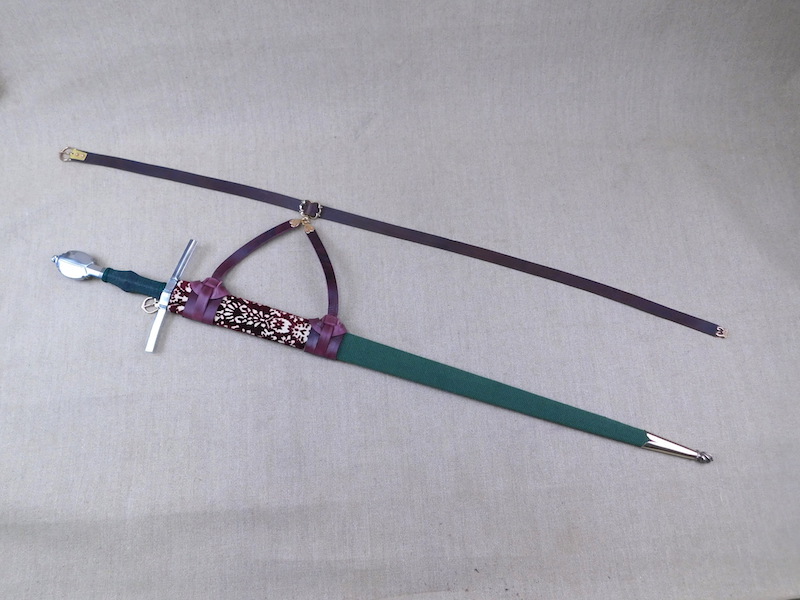 I have just finished a this interesting scabbard and sword for a customer and it is beautifully over the top. The customer very closely outlined the project and so colours and fabric choices etc were dictated, but I then the end result is stunning and of course will be noticed, which was half the point of being alive in the 15thC. 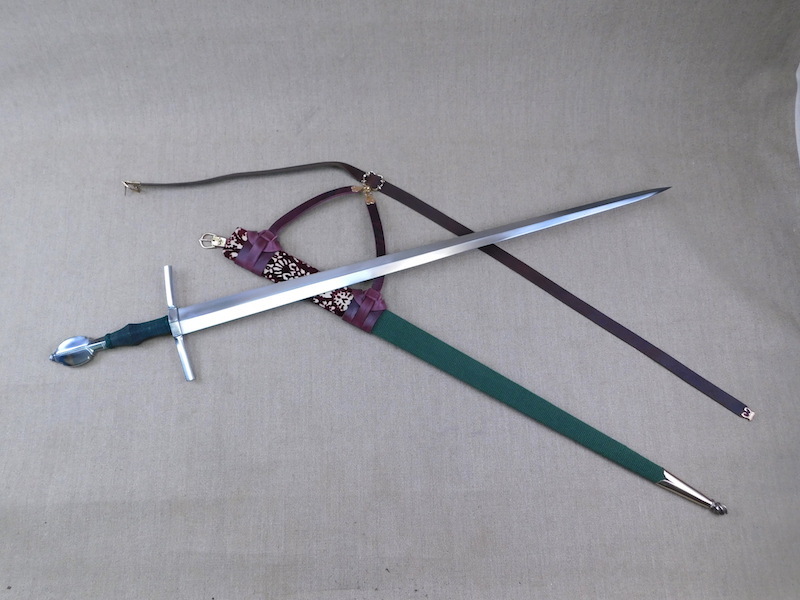 The sword was based on an Albion bare blade (customer supply) and the hilt and grip work is by me. 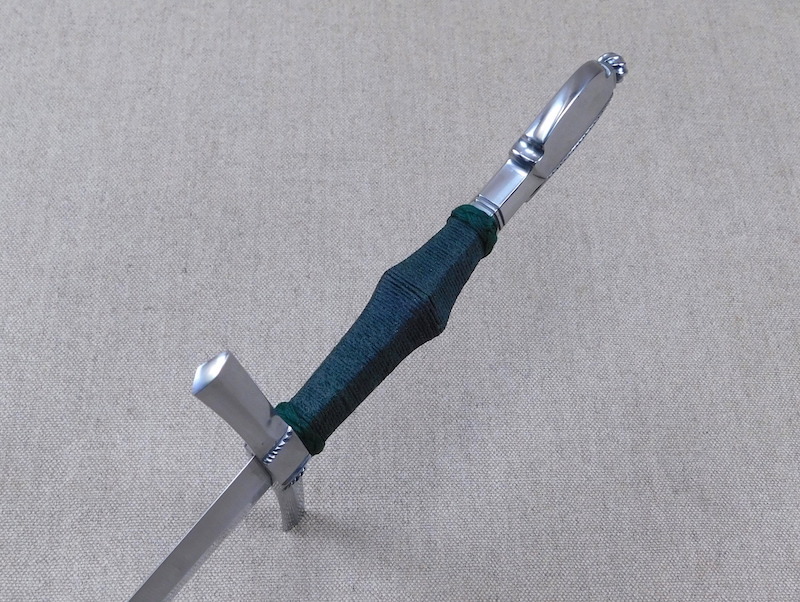 The guard and pommel were popular in both England and Germany and are in steel. The grip is waxed cord over an ash core and terminated in cord Turks head knots. 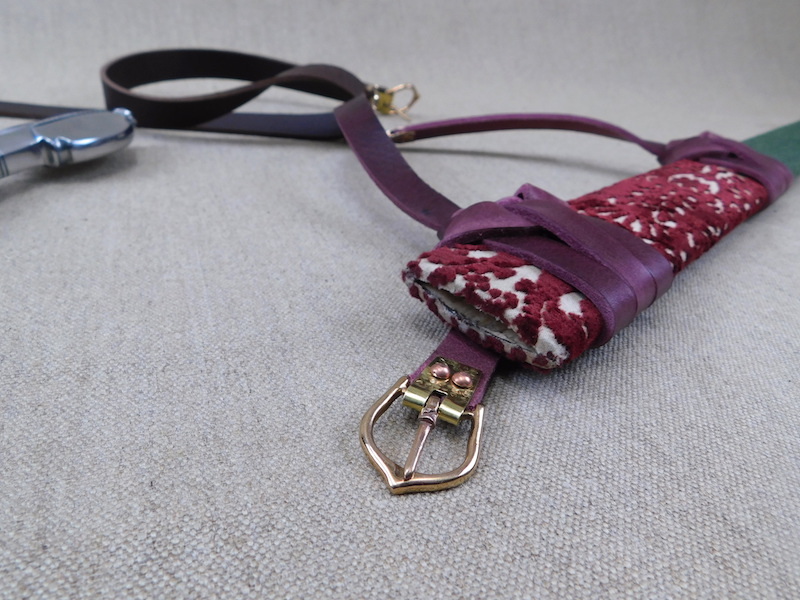 The scabbard has a poplar core and is covered in two types of fabric with the change at the lower scabbard knot; the fabric was sewn not glued. The top of the scabbard has the fabric turned over and glued. 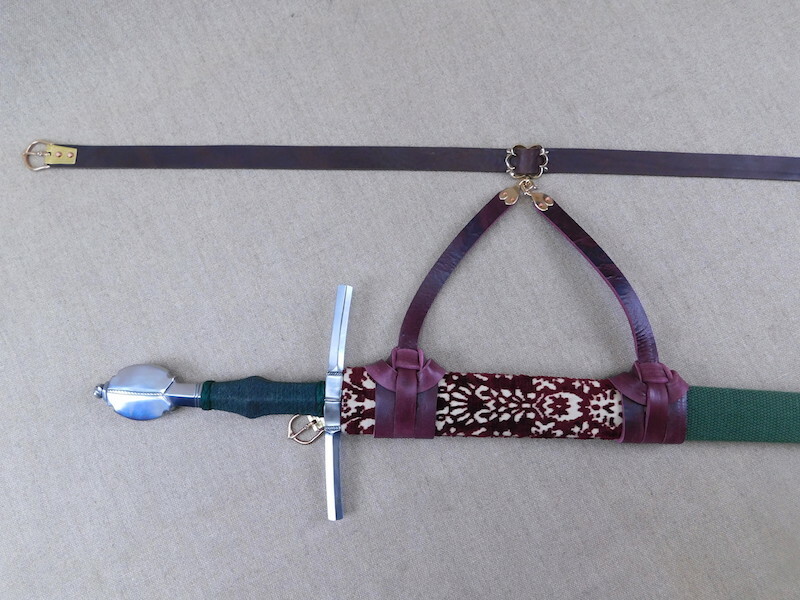 The scabbard is finished with a bronze chape and the belt furniture is bronze also. Is the upper material velvet? 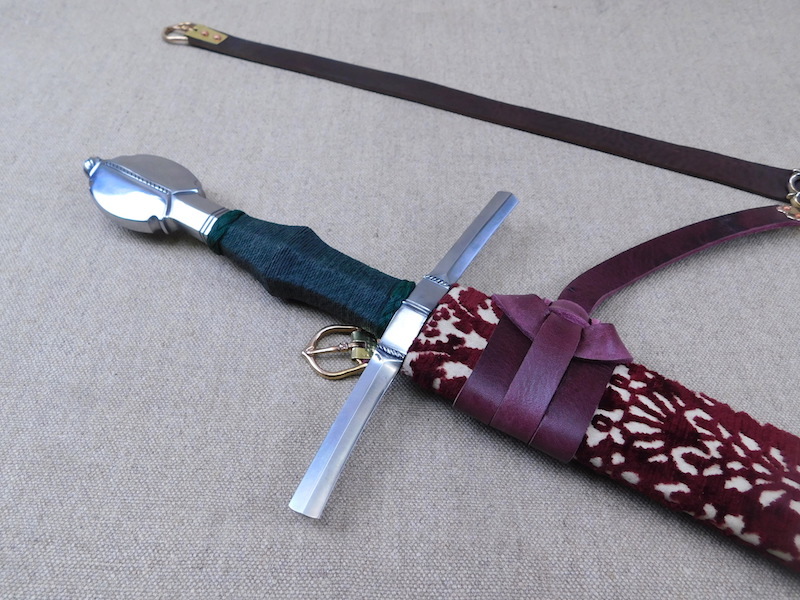 I seem to recall another historical scabbard with a velvet covering, I wonder how common it was. I am curious about "waxed cord". Is it sold waxed, or you somehow soak it in wax before or after wrapping? What's the cord material and diameter? Do you color it with some kind of paint/dye? Alex Indman asked about waxed cord. It can be done in two ways, either bond it first and the n hot wax it, or wax the cord first and then warp it. I use hemp and dye it before doing anything else.